Winner of 3 Grammy Awards! A jazz album by John Daversa Big Band featuring over 50 DACA Artists who play the songs of America, from James Brown's "Living in America" to John Philip Sousa's "Stars and Stripes Forever." The voices of hope and the music of freedom. 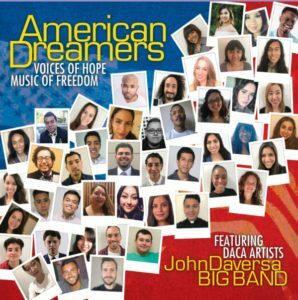 AMERICAN DREAMERS: VOICE OF HOPE, MUSIC OF FREEDOM, the new CD spearheaded by multi-Grammy-nominee JOHN DAVERSA BIG BAND FEATURING DACA ARTISTS, is a deeply personal, emotional, and timely project. It’s musical cri de coeur that gives voice to young undocumented people known as “Dreamers” who, through no fault of their own, were brought to this country as children. They grew up here and were instilled with American culture and values. Yet, as recent news headlines can attest, Dreamers find themselves in the midst of a heated immigration debate in which they and their families face great uncertainty. In 2012, Dreamers were afforded temporary status with the Deferred Action for Childhood Early Arrivals (DACA) policy, but it was rescinded in 2017. There are approximately 800,000 DACA recipients, and 90 percent of them are in school or have a job. Many of them are also musicians, who have come together to create this production, which has received bipartisan support from both Democratic and Republican Senators. “Music has always been tied to the fight for justice. During the Civil Rights Movement, Nina Simone and John Coltrane performed what became anthems for freedom. American Dreamers continues this tradition of using music to send an important message: Dreamers are Americans. You will hear these young Americans performing jazz at the highest level, speaking about their hopes, and affirming their love of the country they call home,” said U.S. Senator Kamala D. Harris from California. “Dream Act children have known no country other than America. American Dreamers features a heartfelt expression of patriotism by talented Dreamers performing the songs of our country,”: said U.S. Senator Lindsey Graham of South Carolina. Daversa is a trumpet and electronic valve instrument (EVI) master as well as a composer, arranger, and bandleader. He’s also the Chair of the Studio Music and Jazz Department at the University of Miami’s Frost School of Music. As an educator and father, he has a strong affinity for young people. And like many Americans, he cherishes the immigrant roots of his ancestors, as his grandparents came from Italy to work in canneries (and play music on the side) in California. Daversa and his production team, led by Kabir Sehgal & Doug Davis, worked with several non-profit immigrant organizations such as United We Dream, FWD.us, and National Immigration Forum to scour the country to find Dreamers, who could play musical instruments and would be willing to participate in the project. “The American civil rights movement, in all its glorious diversity, is built on music. American Dreamers builds on, and advances, that legacy. It is a glorious compilation of musical talent, artistic vision and patriotic passion,” says Ali Noorani, Executive Director, National Immigration Forum. “Jazz reminds us of the power of music and culture to create change. Born out of the experiences and creativity of black people in the South, Jazz is an expression of injustice, resistance and resilience. American Dreamers inspires us by masterfully showing how immigrant youth join in the rich tradition of playing and using jazz as a form of resistance and an expression of freedom,” says Cristina Jiménez, Executive Director and Co-Founder of United We Dream, 2017 John D. and Catherine T. MacArthur Fellow. They found 53 Dreamers in 17 states who fit the bill, from Idaho and Illinois to Texas and Oklahoma The Dreamers come originally from 17 different countries all across the world, including Belize, Bolivia, Brazil, Canada, Chile, Colombia, Honduras, Mexico, Nigeria, Pakistan, Peru, Philippines, Senegal, Singapore, South Korea, Sweden, and Venezuela. Beginning the process, Daversa and the team first selected professional musicians based in Miami, Los Angeles and New York to serve as the big band on this record. They also chose both well-known songs like Living in America and lesser known ones like Deportee (Plane Wreck at Los Gatos). Daversa is a top-notch arranger who writes intricate and demanding big band charts. Finding music students and non-professional musicians who could play his arrangements was one of the biggest challenges of the project. The team started discussions about the CD in November of 2017, and by the time the first recording sessions at the Frost School began in March 2018, they had found fourteen Dreamers who played a range of instruments, from the violin and flute to piano and percussion. They found their first Dreamer through a story in the New York Times. SALVADOR is a clarinetist majoring in music at Indiana University. He joined Daversa’s big band in laying down each track for the CD. As word got out, it didn’t take long for more Dreamers to show up and take their place in their respective section. The Dreamers’ contributions are woven throughout this recording. They performed featured solos, instrumental accompaniments, spoken word poetry, string swells, multi-layered percussion grooves, lead vocals, shout choruses, and electrifying raps. Their musical performances are rich and diverse and reflect the variety found not just in the Dreamer community but across our great nation. CALIPH is a Dreamer who came here at the age of seven from Senegal. He earned a university scholarship but couldn’t attend because of his immigration status. His spoken improvisations on “Immigrant Song” get increasingly more pointed, and in the final passage a group of Dreamers affirm the words “Immigrant” and “Citizen” to bring home the track. DAISY tells at the beginning of “Deportee” that she came to this country with her family when she was just 9 years old to seek medical help for her sister. The song, by Woody Guthrie and Martin Hoffman, is a heart-wrenching testament about the plane crash in California in 1948 that was carrying migrant workers. DENZEL was brought to this country from Singapore at age 5. He’s a trombonist and relates that he wanted to join the US armed services, but his army recruiter told him that it wasn’t possible due to his immigration status. He introduces us to “Stars and Stripes Forever,” the quintessential John Philip Sousa march. JUAN CARLOS is a Dreamer from Mexico who came here at age eight. He is a self-taught organ player and his story introduces “America the Beautiful,” which also features Dreamers softly singing the lyrics to the song at the end of the tune. ALICIA, a young Dreamer from Venezuela, speaks about how drumming has been an anodyne for the anxiety she experiences because of her immigration status. Her story introduces “America” from West Side Story. It is an all-percussion track on which over a dozen Dreamers worked with professional musician MURPH AUCAMP to generate the many layers of rhythm. MARIA loves the flute and jazz. You can hear the joy in her voice as she introduces the next song, an original composition called “All is One.” It’s a feel-good track that gives a feeling of hope. The track features a soaring solo on the Electronic Valve Instrument by Daversa. EDSON is a poet who was brought here from Mexico when he was eight years old. His gripping spoken word poem opens the piece “Red, White, and Remixed,” which is a creation of JAMES, a Dreamer who mashed together several tracks on the album. As the final track on this record, it presents a hopeful glimmer of the future: America’s music and people will increasingly come together. Jazz is perhaps the greatest, intrinsically American art form and one of America's most important cultural exports. Jazz has been the music of freedom and protest, so it is eminently fitting as a vehicle for Dreamers to express their predicament. Putting aside the politics and partisanship of the current debate, all of us can enjoy the songs of our nation. Perhaps this album can inspire us to focus more on what unites rather than divides us. AMERICAN DREAMERS will be available online everywhere and at BFMjazz.com on September 28, 2018.